Lockheed Martin Corporation (LMT), a security and aerospace company, engages in the research, design, development, manufacture, integration, and sustainment of advanced technology systems and products for defense, civil, and commercial applications in the United States and internationally. This dividend achiever has increased dividends for eleven years in a row. The company’s last dividend increase was in September 2013 when the Board of Directors approved a 15.60 % increase in the quarterly dividend to $1.33 /share. The company’s peer group includes Raytheon (RTN), General Dynamics (GD), Northtrop Grumman (NOC) and Boeing (BA). 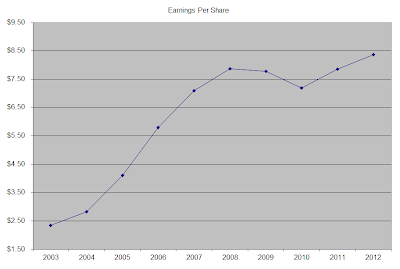 The company has managed to deliver a 15.20% average increase in annual EPS between 2003 and 2012. Analysts expect Lockheed Martin Corporation to earn $9.48 per share in 2013 and $9.68 per share in 2014. 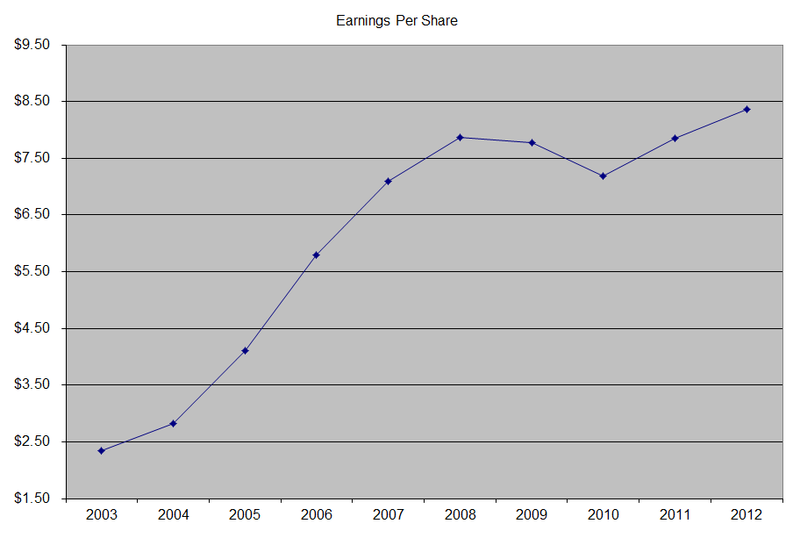 In comparison, the company earned $8.36/share in 2012. Over the next five years, analysts expect EPS to rise by 6.45%/annum. The company has also managed to reduce the number of outstanding shares over the past decade from 450 million in 2003 to 326 million in 2013. With Lockheed Martin, over 80% of revenues are derived from the US Government or US Government Agencies. The problems with the US budget deficit are widespread. As a result, it is very possible that defense contractors would experience decreases or limits to the amount of weapons they can sell to their main customer. This could potentially lead to lower profits and dividend freezes or cuts. In the long-run however, (15 - 20 years from now), I cannot see anything else but increases in US government spending on defense. The world could be a hostile place, and countries need to spend on defense simply to keep up with pace of technology. However, even if you buy today, you can still experience dividend cuts five years down the road, although chances are your distributions would recover within 10 years or so. For additional background on my view of the defense company prospects, check this article. 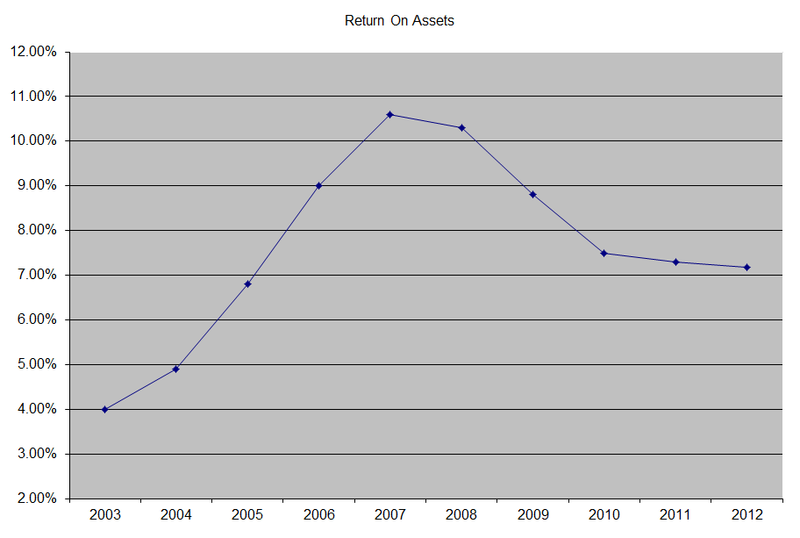 The return on assets increased between 2003 and 2007, but has been on the decline since then. I generally want to see at least a stable return on equity over time. 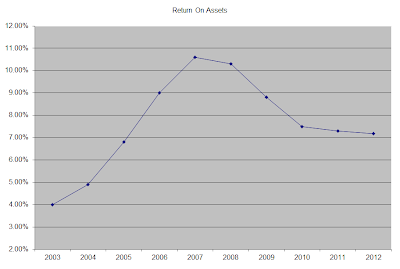 I use this indicator to assess whether management is able to put extra capital to work at sufficient returns. The annual dividend payment has increased by 24.70% per year over the past decade, which is higher than the growth in earnings per share. 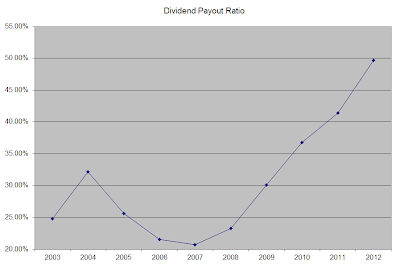 This has been achieved mostly due to the expansion of the dividend payout ratio. Unfortunately, it is highly doubtful that the company will be able to increase dividends per share at this high of a rate over the next decade. Given the outlook for defense spending in the US, even a modest dividend growth would be a positive for dividend investors who hold the stock today. In order to be able to experience dividend growth, investors need to acquire shares of defense contractors when defense spending is on the upswing. 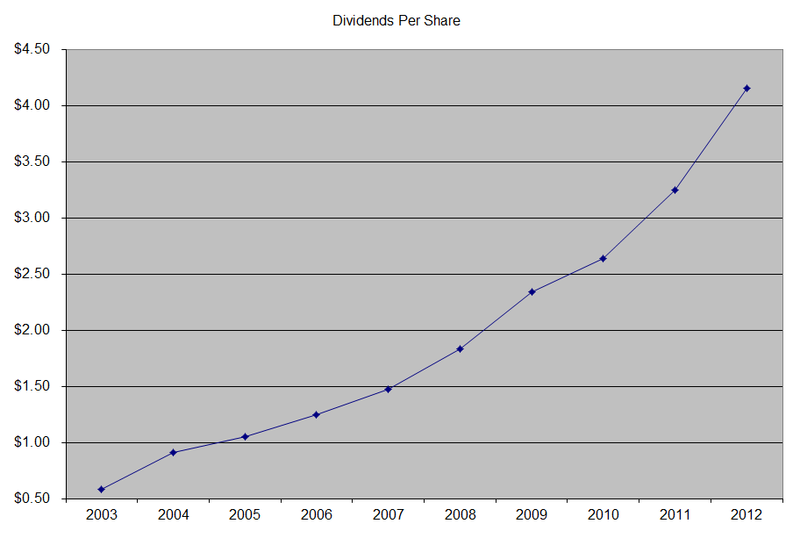 For example, the company froze dividends in 1996 and cut them in 2000. The original Lockheed Corporation suspended dividends in 1969, and did not resume payments until the early 1980’s. 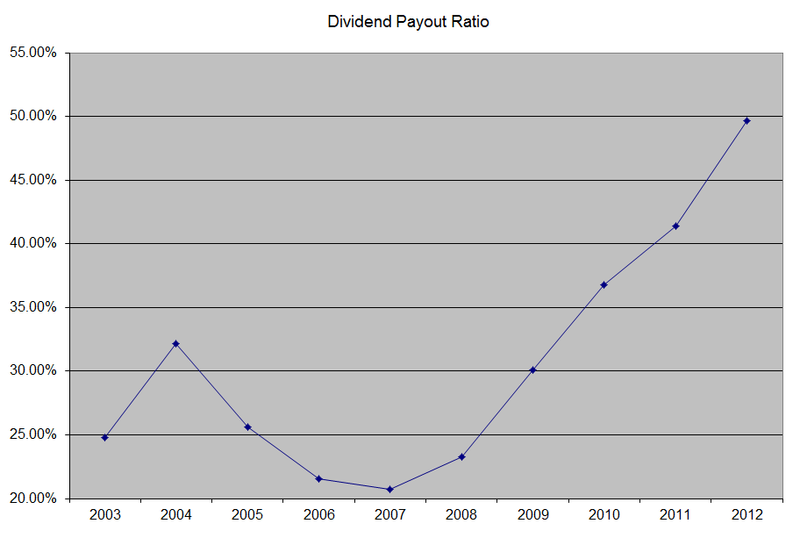 The dividend payout ratio has increased from 25% in 2003 to almost 50% in 2012. Over the past decade, Lockheed Martin has managed to increase distributions at a rate that was much higher than earnings growth, by expanding the dividend payout ratio. A lower payout is always a plus, since it leaves room for consistent dividend growth minimizing the impact of short-term fluctuations in earnings. Currently Lockheed Martin is attractively valued at 14.30 times earnings, yields 4% and has a sustainable distribution. However, a business that is dependent on a single customer for over 80% of their revenues scares me. Despite the great valuation, I simply cannot make myself purchase the stock, because I do not know if earnings won't fall 5 years down the road. I believe there are easier companies for me to invest money in. I see this company as a slightly riskier category than your regular sleep well at night companies like Johnson & Johnson or Coca-Cola. In order to make money on this stock, I need to be able to to get too many variables correctly, such as increase or decrease in defense spending, and how it would impact profitability. While defense spending would likely be higher in 20 years, this does not preclude short-term contractions or freezes in government spending on military over the next five years for example. This could halt earnings growth, and lead to dividend freezes or even worse, dividend cuts. That being said, the company is flush with cash, and since the US defense budget is projected to grow at 2% per year between 2014 and 2023, I think it could be a decent addition for an enterprising investor, if there were few other investment ideas available. Again, as I mentioned in my previous article on defense spending, it might be a better idea to purchase shares in more than one defense company, just so you can mitigate company specific risk.